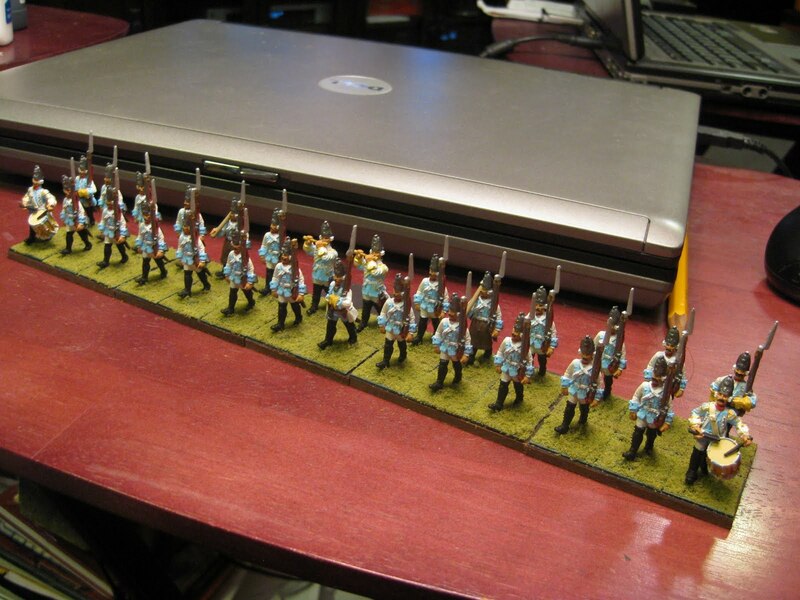 While I've designed my Fleisch-Spatzlestadt forces around some fantastic Minden Miniatures' Prussians, I have found an army for Hefeweizenbach in the collection of SYW Saxons made by Eureka. Initially my goal was to make a not-Bavarian army, but I really liked the Eureka Saxons, so instead have gone with a not-Saxony influence for Hefeweizenbach. 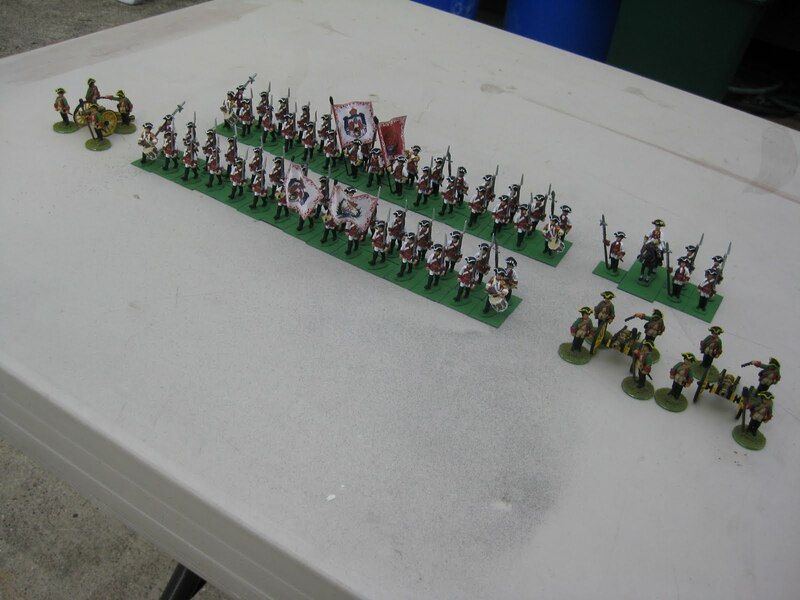 Back in April 2010 I'd made some progress on the Eureka figures and here are two battalions (in Black Powder 30 figure units), along with 3 artillery crews. 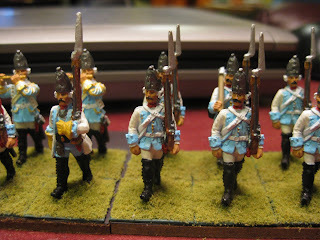 Following this picture, some additional work was done for base flocking and I'll have to setup another round of photos when they take their place in my first Hefeweizenbach Brigade. 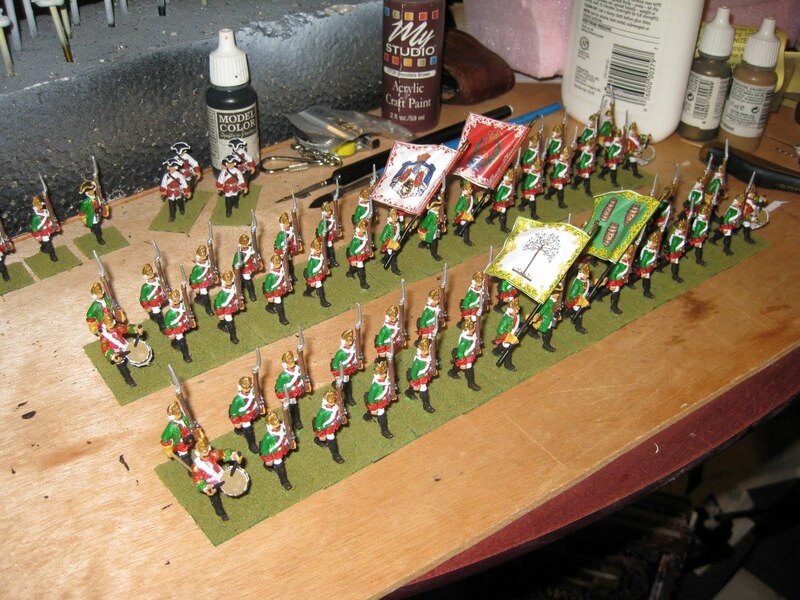 Most recently, in the last two weeks actually, I've painted up some fusiliers (Saxon Rochow battalion inspired). And with the introduction of the fusiliers, I've come up with the Hefeweizenbach flags. The tree is the ancestral arms of the duchy. The tri-barrel flag represents the aristocracy, the people, the army, and that which sustains all. 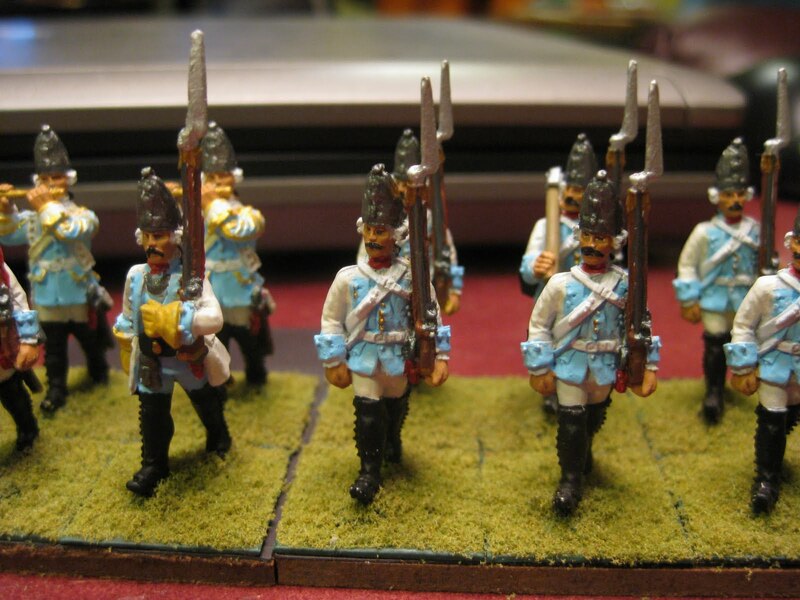 Next up for the Duchy of Hefeweizenbach will be some Grenadiers, Cuirassiers and Dragoons. Thanks for stopping by. What follows is the earliest history of the Duchy of Hefeweizenbach. Hefeweizenbach is part of Greater Bierbauen and in the earliest references it is mentioned as the primary hub of commerce in the larger county of Unterfrappén. Sometime around 1031, Goodenfreud, duke of Unterfrappén, builds a castle on the site. It was destroyed by the emperor's troops when Goodenfreud’s son Goodenfreud the Unhinged rebelled in 1054. He returned to favor and was made duke of Unterfrappén in 1065, and rebuilt castle Hefeweizenbach. He was succeeded as duke by his son Gilbert the Crooked Nose. In 1083, Cube de Bouillon, son of Comte de Boulogne and Gouda of Ardenne, and nephew of Gilbert, inherited the duchy of Unterfrappén. He left no direct heirs upon his death in 1113, and his only brother, Dersquere, died later in 1126. A collateral heir, Lugar, count of Spielmachen, seized Hefeweizenbach in 1128. Bishopric of Dunkelberg retook Hefeweizenbach by force in 1141 following some form of land contract dispute dating back before Lugar, and the emperor confirmed the Dunkelberg rights to Hefeweizenbach in 1155. Some time during the tumultuous Thirty Years War, Hefeweizenbach became its own ducal rank state within Unterfrappén as the influence of the Bishopric had greatly suffered during this time. In subsequent study, more recent events in the history of Hefeweizenbach will be examined, including the ongoing animosity with the Principality of Fleisch-Spätzlestadt and the possibility of open conflict with the Grand Duchy of Erdbeerefelder.